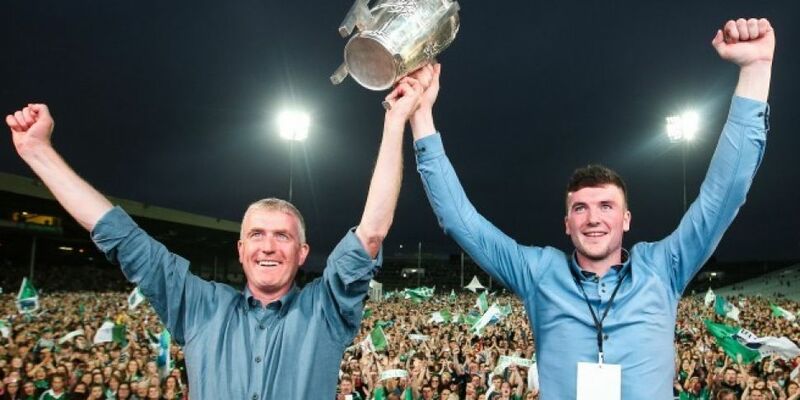 It's estimated that over 80,000 lined the Limerick city streets from Colbert station to the Ennis road as the county's senior hurlers made a triumphant return home. Then around 45,000 crammed into the Gaelic Grounds to celebrate their 3-16 to 2-18 All Ireland final victory over reigning champions Galway. Adare's Declan Hannon collected hurling's most famous silverware in the Hogan stand on Sunday and raised the trophy aloft on shannonside flanked by manager John Kiely. The outbreak of raw emotion both at the full time whistle and when the lads landed back home was incredible. In fairness the Abbey CBS Tipp town principal wasnt shy when called upon to provide a party piece at the Gaelic Grounds! I don't remember Brian Cody or Jim Gavin doing likewise, not that that is a measure of anything, but it does show a sense of fun that the Galbally man appears to have injected into his squad. Not only that, the way he dealt with the 45 year weight of history this season was noteworthy with him saying his players would write their own history and not be defined by the past. Since 1973, Limerick had lost five successive All Ireland finals before dethroning reigning champions Galway by the slimmest of margins. The Limerick boss believes the best is yet to come and sees the victory over the Tribesmen as a "new beginning". Kiely worked the magic with his young charges in just his second year at the helm, to add senior success to their All-Ireland U-21 crowns (2015 and '17) and end 45 years of hurt. The tag of All-Ireland champions brings its own challenges, but Kiely has already set the stall out for 2019 and beyond and is relishing the task of backing up their breakthrough win. Even his mentions of the social challenges Limerick have had in the four and a half decades since 1973 shows a man keenly tuned into his surroundings. Tough on Galway coming up just short but only for Joe Canning they wouldn't have been within an asses roar of their Munster rivals on the final stretch. Who knows what Limerick can achieve from here but what a man to lead them forward.